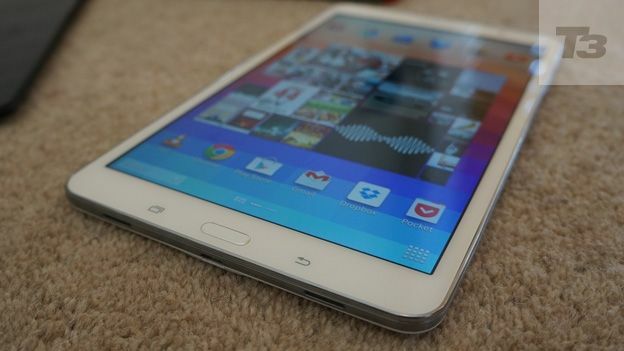 Samsung is said to be working on a new 10.5-inch tablet that will come with a Super AMOLED screen. A specification sheet has been leaked that suggests Samsung is prepping a large Android tablet with the model number SM-T800. The document was spotted by SamMobile. According to the specification sheet, the tablet will come with a 10.5-inch screen with a 2,560 by 1,600 pixel Super AMOLED screen. The tablet is also said to come with a quad-core SnapDragon processor, 2GB RAM and the option of 16GB, 32GB or 64GB of storage. It will – perhaps unsurprisingly – be powered by Android 4.4.2 KitKat. In terms of other features, the spec sheet suggests it will come with an eight megapixel rear camera and a two megapixel front facing camera. It should also feature a microSD slot and a 7,900mAh battery. However, those hoping for a 3G/4G model may be disappointed. According to the sheet, it will come in a Wi-Fi only flavour. There's no word on a global launch date – never mind a UK one. And perhaps unsurprisingly, there's no word on how much it will cost when it does finally land on retailers' shelves.